A little plugin for career mode. Did you ever miss only a few science points to unlock a technode? Do you have too many science points and dont know what to do with them ? Do you want a quick and easy solution for your problems ? Well search no longer! 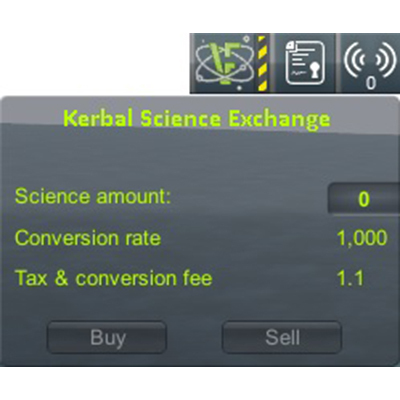 We got the solution for you presenting KerbalScienceExchange! 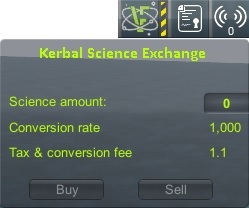 This little plugin allows you to sell your science points directly to the kerbal academy(or the kerbal military) or buy some for some funding. For this plugin not to be too cheaty there is a tax fee and conversion fee. You can affect the conversion fee by raising your reputation, the tax on the other hand cant be modified ingame. All the values are saved in a cfg file in its "PluginData" folder.